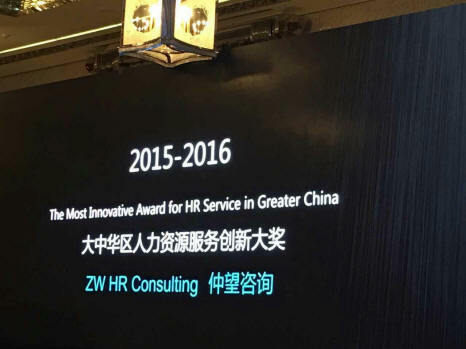 In the annual selection of “Best HR Service Providers in Greater China 2015-2016”, ZW HR Consulting won “Most Innovative Award for HR Service in Greater China” which is organized by Human Capital Management magazine and HRoot. This award aims to highly reward ZW HR Consulting’s significant contributions and outstanding achievements, in promoting the development and progress of HR management in Greater China. 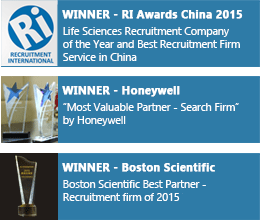 The award aims to recognize the most excellent performer and service provider in the HR field. The grand ceremony was held in Ritz-Carlton Hotel Pudong on April 22, 2016. 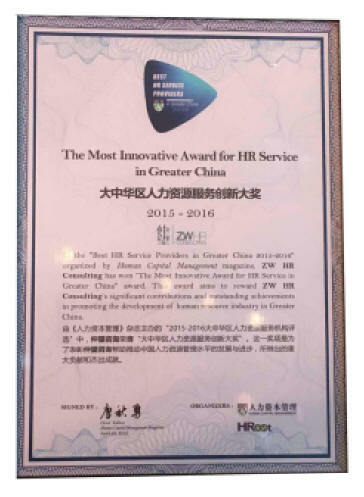 “ZW HR Consulting is delighted to receive this award as Best HR Service Providers in Greater China, as we are celebrating our company’s 18th anniversary this year” said Frank Yu, Chairman for ZW HR Consulting. “We are honoured that Human Capital Magazine, HRoot and HR professionals across the region recognize us as the most innovative HR Service provider. The team at ZW is committed to provide the best practices in the market to ensure we find the right jobs for the right people, and secure the best talent for our clients’ in order for them to grow their businesses. The recruitment process of ZW focuses on delivering high quality and customer satisfaction.” said Frank.